Antique artillery ammunition for the new millennium. The purpose for this site is threefold. 1. I love History and antique weapons. 3. I would like this site to be self-supporting. Any constructive comments are welcome, and questions will be answered as soon as possible. Just added, a new page for listing your personal items for sale! CLICK HERE to check it out! Click on Pictures for larger image, description, and current pricing.. Ammunition for the new millennium means politically correct ammunition that will not fire, and is intended for the use of historians and collectors for exhibition. There is no live ammunition manufactured. All rounds are fixed (this includes the projectile strapped to the sabot and tied to the powder bag), and ready to load with one exception, they are "inert". There is no powder in the powder bag, in the shell, or in the case shot. All rounds are reproduced as accurately as possible to the original government specifications. Please remember that the sabot and powder bag were handmade and they would vary from manufacturer to manufacture in style, material, and method of attachment. Both US and CS governments used the same fixed round for smooth bore cannon. Rifled cannons did not normally use a fixed round ( some exceptions do exist) at this time, only smooth bore ammo is being offered. The workhorse of the civil war was the 12 pdr Napoleon style cannon, while a 12 pdr field howitzer, a 12 pdr mountain howitzer, and a 12 pdr mortar all fired the same size projectile. 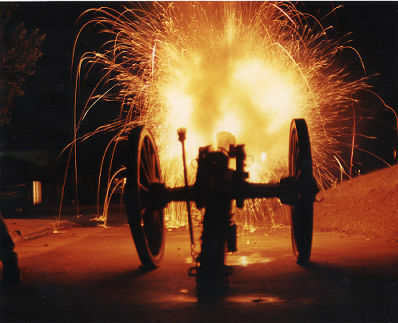 The mountain howitzer came into it's own in the west during the Indian Wars but it did see some use in the western theater during the Civil War. The field howitzer lost favor due to it's lobbing effect, instead of direct fire while the 6 pdr was simply too light to be effective. Early in the Civil War, General Robert E. Lee suggested the 6 pdr be replaced with 12 pdrs. By July, 1863 at Gettysburg, only one 6 pdr was fielded, and that was by a South Carolina unit. The South carried several 12 pdr Field Howitzers to Gettysburg, while the North disposed of theirs (due to superior manufacturing capabilities) by the time of Gettysburg. There were as many calibers and styles of cannon as the mind can comprehend. such as the 2 pdr, 3 pdr, 4 pdr, 6 pdr, French 8 pdr, 9 pdr, 12 pdr, 18 pdr, and 24 pdr, all in smooth bore field guns. So, for now I have concentrated on the most common calibers- the 6 pdr and 12 pdr as well as one other interesting caliber; the the 2 pdr Woodruff. Union General Grierson carried a battery (probably 6) Woodruff 2 pdr guns on his 1863 raid from Tennessee through the Mississippi into Louisiana as part of a diversion planned by General Grant to aid his Vicksburg, MS. Campaign. These guns carried two types of ammunition; shot and canister. The guns were light, iron barrels weighing only 165 Pounds and could travel at the speed of cavalry, and they did not need the good roads that the heavier guns required. So they were more mobile. Parts & Equipment - includes: rammer heads, slaplocks, lanyards, sponge heads, worms, lead shot of various sizes, sights, elevating wheels, and other hard to find items. If you need it, I probably can find or at least tell you where to find it or how to make it. Question or comments about this web site?